I recently told you that i was hunting for rain so that i could do a proper review of the Swims show covers… and previously i showed you the beautiful photographs from their catalog… well yesterday when i went up to Sausalito for a meeting, it was RAINING! Well drizzling, and then got incredibly rainy as i came out of the tunnel… so here is an impromptu photoshoot and walk through of my Swims experience. Here are the suede Theory flats i was wearing… you can see the rain pelting down on my windshield… and suede flats + rain + a bit of walking is never a good combination. Enter, Swims! 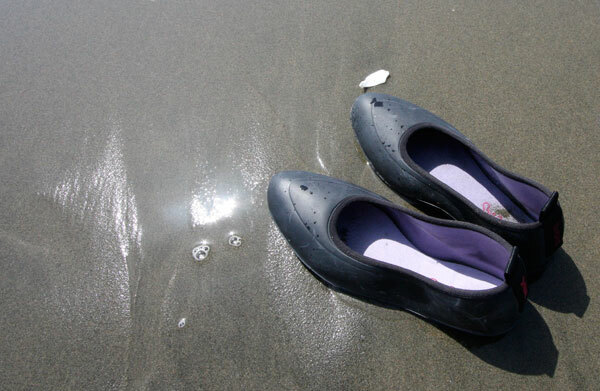 I pull out the handy carrying case, slip out the Swims… and slip them over the flats… not too hard, and a perfect fit. 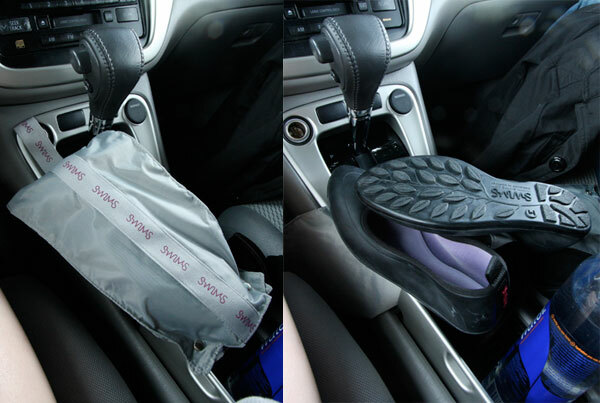 As you can see, you can’t even SEE my flats anymore, they are nicely protected from the elements, and off we go! 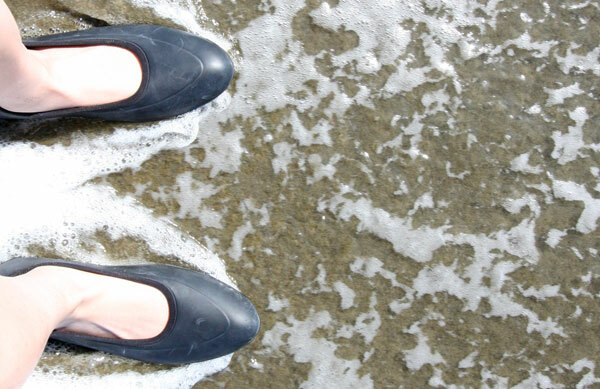 I ran around in them, and walked around Sausalito in the rain in these for a bit - and it is definitely nice to have some added traction, no fear of puddles, and not need to worry about my shoes underneath. Unfortunately no pics of them in action in Sausalito, because as i wandered to my lunch meeting, the sun came out in a big way. The Swims certainly had my feet getting quite toasty in there at lunch, although to be fair, i was getting pretty tan in the corner window as the sun burned through. Removing the Swims from my soft suede flats was not super easy, but that is also probably why they stay on so nicely… its a two handed task for sure. What was really nice however, was how thin and floppy/flexible the swims are on their own (so really you dont want to be wearing them without shoes) - and with shows in them, they are basically super versions of your own shoe, and quite comfortable to walk around in (you barely notice they are there as you walk). 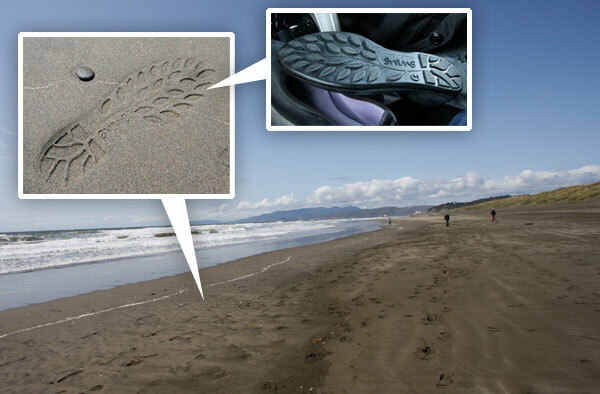 Fast forwarding, i was determined to try out their foot prints and get a few pics, and also get them a bit more wet… so off to the beach! The freeeeeezing cold SF ocean beach. 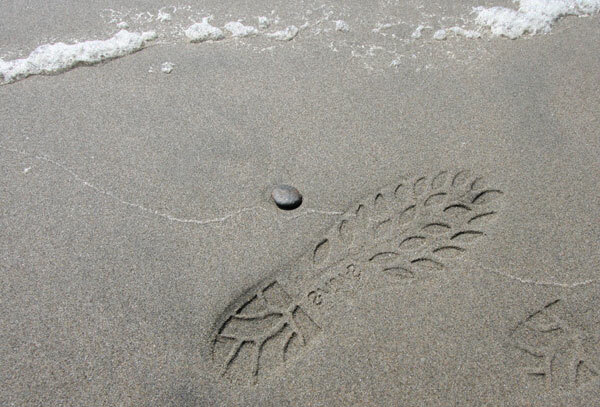 Here is one of the best footprints i made - the tree and its roots with every footprint look quite cute after you run all over the freshly wet sand at the edge of the tide. It seems like although they have a slightly flocked inner lining, they are quite water proof, because i got splashed by a larger wave, and did get a little wet inside, and the water rolled right out. So my conclusion is… Swims are definitely worth keeping in your car for flats/fancy sneaks you don’t want to risk getting soaked… or random romps in the mud… for an LA girl, rain and random flash floods aren’t a common enough occurrence to always plan footwear accordingly, so these are definitely handy to save my precious new Lanvin flats in unexpected inclement weather… and will probably accompany me to NY and potentially rainy destination. Now if only there was something to protect my HEELS!